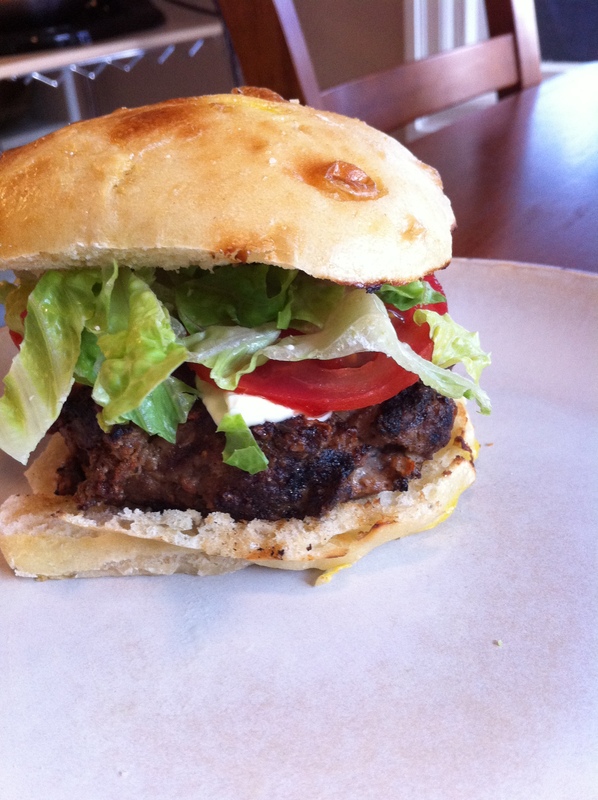 Oh the feta stuffed burger where have yo been all my life? Your discovery was welcomed and glorious, you will now be a staple in my grilling rituals. I suggested to Brian to pull out the grill, and get some meat ready for good ol burgers. But shortly after my suggestion came, I realized we did not have any cheese, and I am sorry but I like cheese on my burgers. So I pouted for a moment, until I remembered, Oooo we have feta, how am I going to pull this off without making a mess on our grill? Well, stuff em right? Brian thought up that one, just make two thinner patties, fill with the feta, crimp them off and gently place on the grill. That is exactly what we did, and wow were they good. Salty, but not too salty, tangy cheesy, melty goodness. We have now made them twice, first was the test run, second time was just to make sure, and yup, this recipe is a keeper. Here is to not having “regular” cheese in the house! Woohooo! 1. Heat up the grill, get it HOT on one side to get a good sear on the burger to lock in the juice and keep the feta inside from melting out. 2. Combine the meat salt, pepper, paprika, and oats well. But do not squish the meat, just gently combine. Add mustard and Worcestershire sauce, mix well. Add egg. Combine. 3. Take a piece into the palm of your hand the size you want your burgers to be and flatten out. Sprinkle the feta into the patty and press it gently into the meat, but not all the way through. Cover with the same size patty, and crimp the edges down tightly. Repeat with the rest of the meat. 4. Take a brush or paper towel soaked in olive oil and oil the grill well. Place each patty gently on the grill, and sear on each side for at least 3 minutes, or until it looks well seared. Move to medium heat for the rest of the cooking time. About 5 minutes. 5. Serve hot with your brioche buns, and baked sweet potato fries!